A Muslim association in the Austrian capital Vienna is distributing hot meals to homeless and needy people, the association told Anadolu Agency on Sunday. 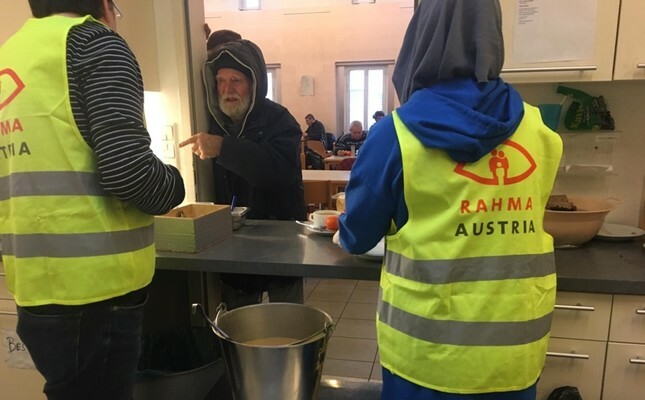 Deputy head of RAHMA Austria association Omer Batur said since three years they provide hot meals to homeless people several days of the week. Batur said they provide hot meals to around 100 homeless people in a day. He said both Austrians and the foreigners living in Austria received the project "very positively". "With projects like this, Muslims can give the message 'we are living in this country and we are in a search of solutions to common problems of this country' to the society they live in," Batur stressed. Batur said social events like this is an important way of struggling with far-right rhetoric which has risen in the latest period in Austria. He added that RAHMA Austria association has been providing aid to many needy people around the world for 25 years, including Syrians, Rohingya Muslim, and Palestinian refugees.